University of California delegates attend the COP24 conference in Poland. A saucer-shaped arena set in the heart of Poland’s coal country seems like an unlikely place to host a global climate change conference. And yet, for two weeks in December, more than 20,000 delegates from nearly 200 nations converged in the Silesian capital of Katowice, Poland, to attend the 24th Conference of the Parties (COP24). The conference, held from Dec. 3-14, 2018, was the latest in a series of meetings led by the United Nations Framework Convention on Climate Change (UNFCCC) to tackle the global issue of climate change. “It was so interesting to see how this kind of global policy is created,” said Kat Montgomery, a Master of Advanced Studies student in the Marine Biodiversity and Conservation program at Scripps. A first-time attendee of the UN talks, Montgomery described her experience in Poland as “illuminating” and said she gained a better understanding of the role of non-governmental and research organizations in the UNFCCC process. “I think the UC’s biggest accomplishment at COP24 was being able to give so many current and future scientists a chance to attend a conference like this, where they could learn about and potentially influence global policy,” said Montgomery. In Katowice, she and other UC delegates observed some of the complex negotiations in which nations hammered out the details of a common rulebook to implement the landmark 2015 Paris Agreement. The rulebook defines how nations will enact their climate pledges to keep global temperatures well below 2°C above pre-industrial levels. It also provides a universal framework for measuring and reporting emissions with greater transparency and supports climate financing to poorer nations, among other things. In the UFO-shaped Spodek arena, the UC delegates hosted an exhibit that highlighted the ocean’s reach on global climate. 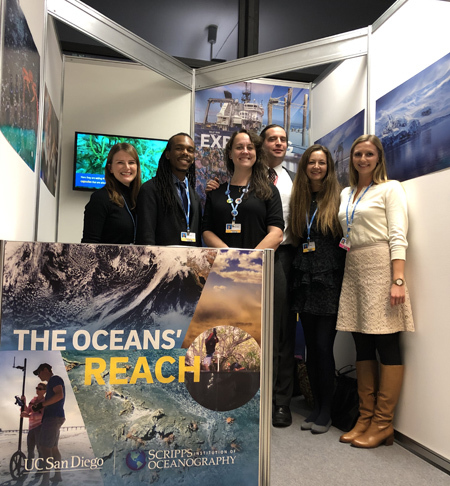 The exhibit allowed Scripps students and UC affiliates to connect with delegates from around the globe and raise awareness about the importance of ocean and climate science being included in global policy decisions. One meaningful interaction occurred when Tibetan delegate Zamlha Tempa Gyaltsen stopped by the UC exhibit to drop off a hand-signed letter from His Holiness the Dalai Lama—a well-known champion for climate science with deep connections to UC San Diego. In the letter, His Holiness thanked the COP24 delegates for striving to create a “better environment for the world so that future generations will be able to live a healthy, happy life.” He also urged humanity to recognize that climate change affects everyone on Earth and that we must take serious action now. UC delegates also led six press conferences and participated in other side-events to communicate the latest scientific research on topics ranging from ocean deoxygenation to geoengineering to the value of deep ocean observation networks, and more. “The conference is an enlightening experience that comes with a sense of worldly connectedness and inspires nations to collectively work toward changes for the good of humankind,” said Scripps PhD student Tashiana Osborne, a two-time attendee of the UN climate talks. At COP24, she and fellow Scripps PhD students Kara Voss and Meredith Fish held a press conference to discuss the science behind atmospheric rivers and extreme weather patterns linked to climate change. COP24 marked the third UN-led climate talk attended by Osinachi Ajoku, a Scripps PhD student studying climate science. His research focuses on how aerosol particles produced from biomass burning affect climate patterns in Africa. Ajoku said that attending three conference sessions has given him a holistic outlook on how countries address climate change by factors such as culture, location, and economic standing. “It has also allowed me a unique perspective of how countries in Africa are progressing in climate change relative to the rest of the world since that region is the focus of my research,” said Ajoku, a Los Angeles native with roots in Nigeria—which he says makes his African research feel more personal. 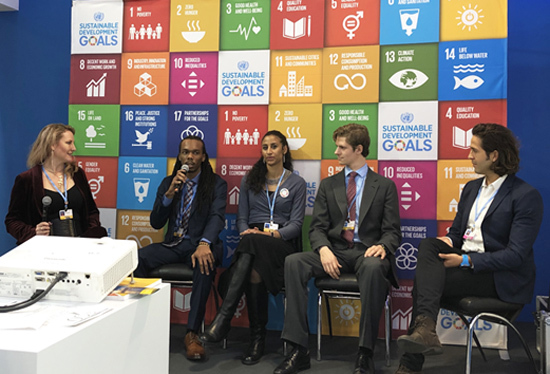 While at COP24, Ajoku served as a panelist for a discussion at the United Nations Sustainable Development Goals Pavilion on the topic of investing in education for the future of sustainable energy. The panel was moderated by Scripps alumna Megan Bettilyon (MAS ‘10) of philanthropic investment fund Global Good and also included Scripps postdoctoral scholar Yassir Eddebbar, Osborne, and Yale student Holden Leslie-Bole as panelists. Each panelist underscored the importance of educating the youth about climate change and discussed the increasingly vital role of science communication to inform and inspire communities to tackle the massive problem of climate change on a local level. The University of California has been sending delegations to COP for the past 17 years, and the continued effort has already made noticeable waves. Giron noted that this year, many members of the UC delegation had talks with other delegates who have read a scientific paper on ocean-related Nationally Determined Contributions that was written by Scripps’ Natalya Gallo and Lisa Levin, and GPS’ David Victor—all former participants in the climate conference and members of the UC delegation. Montgomery echoed Giron’s sentiments on the importance of having UC delegates involved in the annual conference. Scripps supporters Ellen Lehman and Charlie Kennel, Gail Fliesbach, David and Peg Engel, and Global Good provided funding to send the Scripps delegates to COP24.